Sunday was one of those days where I couldn’t settle to anything. Cockrobbinn and I had been looking after two of our grandchildren on Friday and Saturday whilst their mummy was having a well-earned break at the Isle of Wight festival, and daddy was busy working. Sunday found us tired but not sure what to do. At lunchtime I suddenly announced to Cockrobbinn that we should try to find the local caches which had eluded us so far; seven in all – none more than a mile or so away from our home. One thing about having a Geobag is that everything is always ready to go! First off we headed towards the ‘Rolling Stones’; four caches placed on training ground belonging to the MOD just off the A30. We had attempted this series during the winter months and had eventually located Jagger after much searching but had failed to find Wyman, Watts and Richards. As it turned out, they weren’t particularly difficult but each time we tried, the weather had been against us and we had given up quite quickly. However this time we definitely had our geo-eyes in and walked straight up to them. 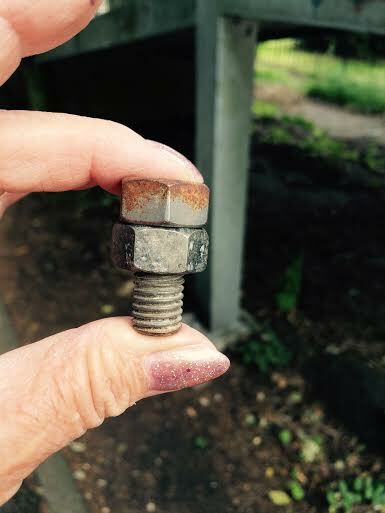 Perhaps we were getting a little more savvy about the different caches and hidy-holes. Three crossed off our list of DNFs. A good feeling. The cache hidden in the underside of a log was a good hide; not so sure about the poop on the top of the log though !! Whilst we were in this neck of the woods we managed to locate Leaning Birch Tree and at the same time, had a bit of excitement which I mentioned in my blog Wow! and I held them up…. Although not officially a previous DNF as it was out of commission when we had originally looked, it was still another off our list. We were on a roll …. Just down the A30 from the MOD land was Pen Y Bont North; a cache we had failed to find on many occasions. I knew Pen Y Bont was Welsh for Bridgend and with a large metal bridge crossing the A30 we just knew the cache was placed somewhere on the northern end. The first time we had tried to find it there had been roadworks and the north end of the bridge had been sectioned off but the barriers weren’t very high so we skipped over them and started our search. We were soon approached by hard-hat number 1 who was very pleasant and wanted to know if he could help us at all; even pointing out the enormous trench we were standing besides and telling us not to fall in as we might hurt ourselves. After all, we were two very respectable senior citizens poking and prodding about among the girders of a very dirty bridge. However, hard-hat number 2 was a different kettle of fish and we were very abruptly ordered away and told in no uncertain terms that we were NOT allowed anywhere near the bridge for whatever reason, and he didn’t want to see us back again. Miserable git ! We searched the end of the bridge on another couple of occasions once the roadworks had finished but with no success. Unbelievably this time we walked up to the bridge and I found the cache within a couple of minutes. It had been there all the time and we must have looked straight past it before as it just blended in with the surroundings. A metal bridge with hundreds, if not thousands of bolts holding it together and one of them was our lovely little cache. Wow…..five found. Century is in a small copse; one of those that you have to creep through thick undergrowth and then find yourself among spindly trees, a canopy of leaves overhead and a bit dank, dark and smelly with a lot of beer cans, plastic bags and goodness-knows what rubbish hiding in corners and scattered around. It was a good place for a hide if only it wasn’t quite so messed up. Cockrobbinn and I had searched here very early on in our geocaching career but with no success. I had also called in on my own one afternoon but didn’t feel particularly comfortable creeping through the shrubbery. Feeling on a high with five DNFs sorted, we decided to give this another go especially as it was so close. Our geocaching god was with us as nestling underneath a very dark and spindly tree was our little cache hidden in an imitation fir cone and the only reason we spotted it so quickly was that it was identical to one we had found very recently. It so blended into the ground that we could have walked over it numerous times without noticing it. Six finds and we had one more we wanted to try before returning home. Surely luck must be with us. Maultway #6 was hidden among a lot of tall trees and each time we approached GZ our GPS signal went haywire. We managed to narrow it down to within about 3m and I spotted a tree with many holes and crevices – one filled with the remains of an old birds’ nest. On a previous occasion I thought I had found the hiding place but after removing the nesting material the hole appeared empty. The clue wasn’t helping much either “round the corner”. We were in a wooded area on a small bendy path with many corners !!!! This time though my brain suddenly clicked into gear and I realized which corner it was referring to and it wasn’t the path. I removed the birds’ nest and Cockrobbinn carefully reached in and lo and behold there was a corner and around it was the cache. So simple when you know where to look. How many times have I said that? What a good day; seven finds which we had failed to find on earlier occasions. This trip took place on 14th June 2015. 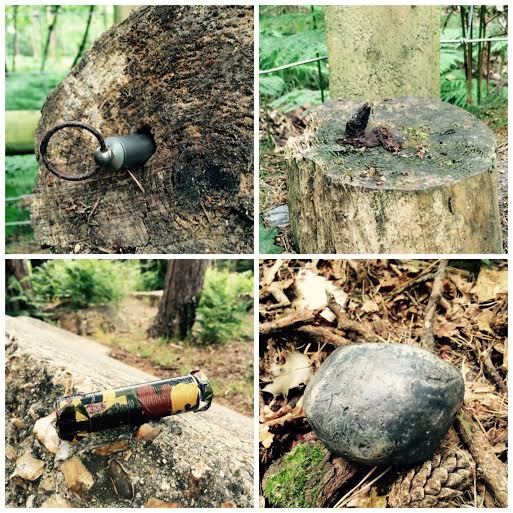 This entry was posted in Camberley, DNFs, Geocaching and tagged Caching, Camberley, DNFs, Geocaching, GPS. Bookmark the permalink. There ain’t nothing finer than the feeling you get when you vanquish some DNFs. Well done!